Elk Lake School District staff (top) practice counter techniques for those who do not have time to evacuate, lock down, or barricade. Above, Susquehanna County D.A.R.E. officer Gene Michimski (left) and deputy sheriff Jon Record (right) conducted ALICE training at the Elk Lake School District in August. District superintendent Ken Cuomo holds the soft touch gun used in the drills. The district has since conducted active shooter drills with students. Fire drills have been a mainstay of school safety protocol since the late 1950s, and they have been amazingly successful. Not only have students and teachers learned how to safely evacuate a school, engineers and school officials know much more about how fires start and spread and how to prevent them. Prevention and response are key components of a new program addressing a modern danger to schools. 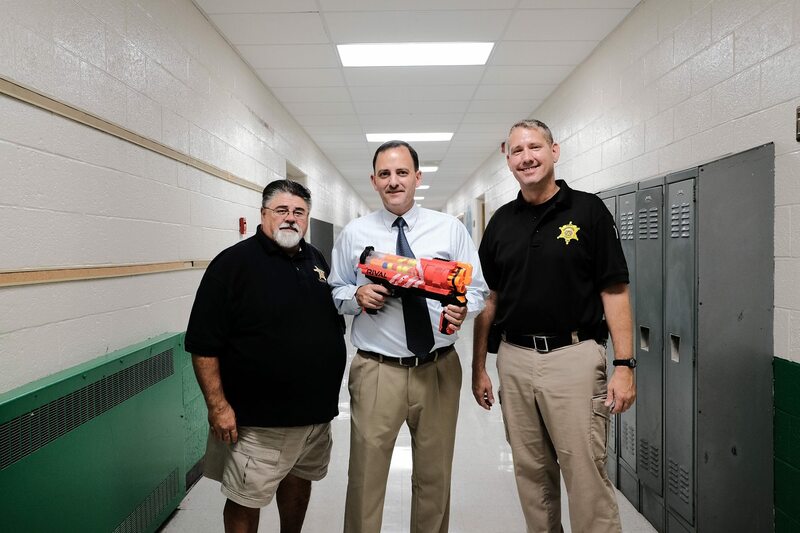 Susquehanna County sheriff Lance Benedict and chief deputy Jon Record have been taking the ALICE program to local schools in an effort to prepare staff members for a potential school shooting. 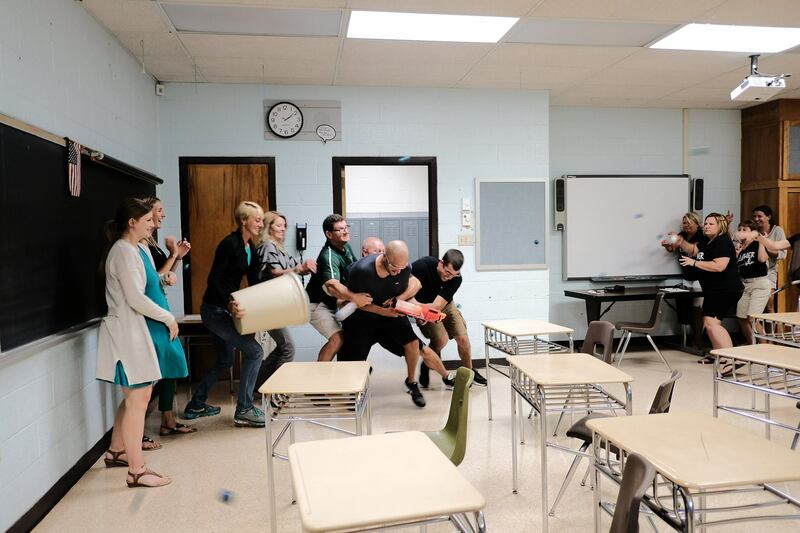 Both went to Bradford County in 2017 for training that they can now share in a school setting through a combination of classroom work and hands-on drills for simulated live-shooter scenarios. So far, faculty at the Mountain View, Elk Lake and Susquehanna school districts have taken part. In the Blue Ridge School District, school resources officer and retired Gibson State trooper Greg Deck is one of four administrators who are trained to conduct drills. Deck, who works closely with school safety director Matt Nebzydoski, started modifying fire drills last year in preparation for the changes to come. ALICE stands for Alert, Lockdown, Inform, Counter, Evacuate and can be modified for healthcare facilities, businesses, government buildings, and houses of worship. According to Record, participants get an hour lecture and Powerpoint presentation before moving out into classrooms, hallways, and larger open areas. The tactics differ in each of those locations. “It’s training everybody not to sit there and do nothing,” said Benedict. “You’ve got to do something or die.” And, of course, know when to run. “From the perspective of a hunter, you know how hard it is to hit a moving target,” he remarked. Benedict summarizes ALICE as “situational awareness” and maintains that the lessons can be applied to other aspects of life as well. “If you are in a restaurant, know where fire exits are. Watch who goes in and out the door,” he offered as an example. No students have died in school fires since 1958, Record maintains, because of introduction of fire drills after 95 teachers and students of Our Lady of the Angels School in Chicago died when they were trapped on the second floor of the building. 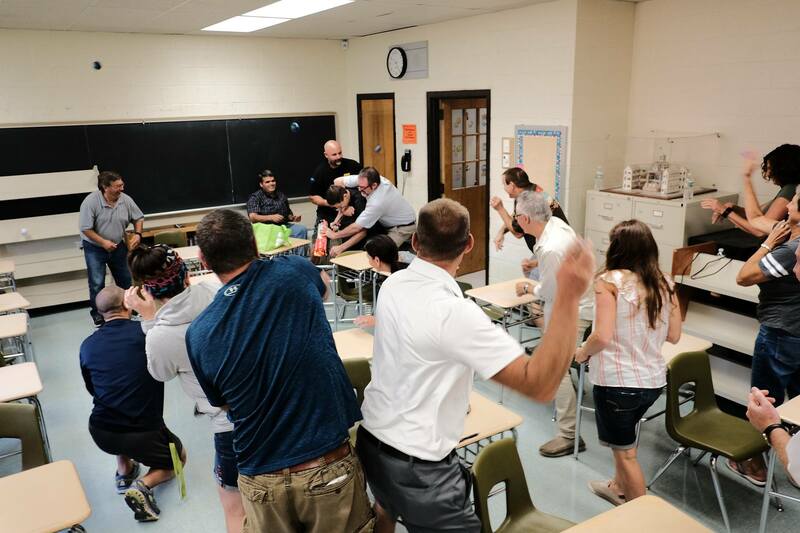 The Elk Lake staff participated in the ALICE training prior to the start of the new school year and has since conducted an active shooter/intruder drill with students K through 12 and those on the technology and career center under the observation of the Sheriff’s Department. Staff and trainers assessed the drills for successes and weaknesses. “We plan on additional drills over the course of the year to improve our response to safety situations,” said Cuomo. Blue Ridge is considered an “ALICE Certified School.” More than 70 percent of the staff has to be trained for that designation. Deck suggested that they are actually much closer to 100 percent and are planning to involve students in their next active shooter drill. For more information about ALICE training in Susquehanna County, interested readers may call the Sheriff’s Department at 570-278-4600 ext. 6653.